No need to dilly dally with chit chat here today. 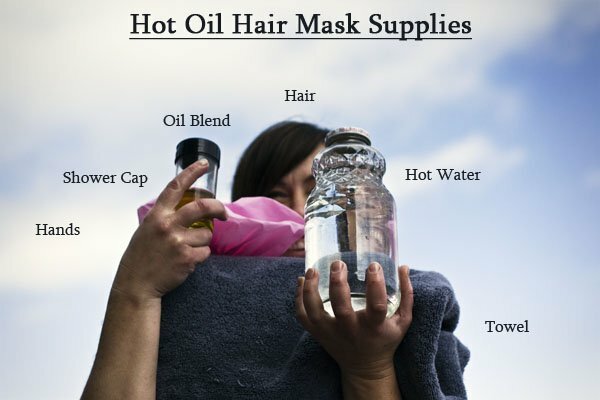 Many of you jumped right in and started making your hot oil hair treatment yesterday, so you’re pumped and ready to go. 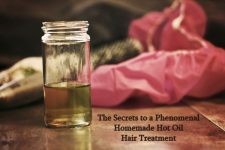 If you missed part one, here it is again for your edification: The Secrets to a Phenomenal Hot Oil Hair Treatment: Part 1 – Creating. Once you’ve created your oil blend, there’s little else you need to create your luxury spa hair treatment at home (except maybe a muscular yet sensitive shampoo boy). In addition, you’ll probably also want: Relaxing music, chocolate, a shower, some form of shampoo or washing material, a kimono. Really, just the shower and hair-washing material is necessary. Also, the kimono. In most states, by law, you cannot apply a hot oil hair treatment if you’re not wearing a kimono. So now that you have everything you need, here is how to apply it. Again, I want to reiterate that this is how I do it – it’s my personal refined routine. That doesn’t mean it’s the only way, and it doesn’t even mean it’s the best way for you. But it probably is. It will take maybe a minute or two for the oil to warm up to just about the water’s temperature. One thing your scalp really needs is stimulation. So when you start applying your hot oil hair treatment, do it at the very roots of your hair and rub in circular motions. I like to start in the temple area and work backwards, squinching my fingers back and forth as I go. This scalp massage serves several purposes: It helps dislodge hair that’s about to fall out anyway, which will encourage new hair to grow faster; it stimulates the circulation in the scalp which promotes hair growth, and it helps the oil sink into your head, making your skin there healthier and softer. It also revives and relaxes your entire being, leaving you in a zen-like trance for the remainder of your hot oil treatment. Once you’ve massaged your scalp with the oil for 3-5 minutes, move on to applying it down the shaft of your hairs. This is where you can be a little less liberal with your oil application. Your hair does not need to drip with oil. You’re going for a nice thin sheen right now. Too much oil, and washing will be difficult. Bonus Protip: If you want to do double moisturizing duty after you’ve applied the oil to your hair, throw some gloves on your oily hands to lock it into your skin. When you’re done, you’ll have super soft mitts with which to touch things or people. I strongly recommend, if you’re going to do hot oil hair treatments on a regular basis, buying yourself a shower cap or two. I’m not particularly fond of the “wrapping your head in plastic wrap” method, because it’s wasteful and awkward to do. So all you do now is tuck your hair up into that shower cap (or plastic wrap, if you so insist) and then heat a towel with very hot water. Occasionally, I’ve found recommendations to use two towels and alternate warming them and refixing them to your head when they get cold, but I think that’s overkill. Once you’ve warmed and opened up the hair follicles and cuticles, the oil’s going to continue sinking in no matter what. Once your towel starts to get cold, just pull it off your head and let the natural heat from your scalp (under the shower cap) do the rest of the work. This time is your time. I’ve been doing my hot oil treatments (HOT) for 2 years already. I found two things that I’m trying to keep in mind every time I make my HOT now: never ever use too much oil ( oil is a pure LUXURY, so prize it as a greatest gift from Nature to you) and the most important thing – do it regularly. Use a bit of oil, but every week. I really mean it. And the last thing! Make it a celebration! I already look weird enough with my hair in oil and a huge towel over my head so I celebrate my growing beauty and have a lot of fun! When you first get into the shower, rinse your hair with the water on the warmest setting your skin can handle. This reheats the oil and gives your hair one last boost of extra moisturizing. Then go about your showering business, waiting until the very end to shampoo the oil out. You may need to shampoo twice, but you’ll be able to tell by the texture and feel of your hair when you’ve gotten all the oil out. There is a strong (almost definite) possibility that you will not need to use conditioner after shampooing – but you’ll be able to tell based on the feel of your hair. At the end of rinsing with the shampoo, turn the water temperature to tepid. So it’s about the temperature of your body, maybe a little colder. The remaining oil will rinse out MUCH easier if you rinse using tepid water. I don’t know why, but it does. If you have hair that touches your neck and shoulders, after you’ve washed out the oil, you’ll want to hold that hair up off your neck and wash your neck completely, removing all the oil that’s stuck to your skin. If you skip this step, once you let your hair down, it will gather the oil from your skin and look oily within minutes of drying. Let your hair air dry as long as you possibly can, waiting to use a hair dryer until your hair is at least 3/4 of the way dry. This is a good tip for all the time, actually. 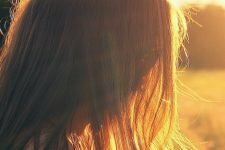 Extended exposure to hot air damages your hair, so try to limit it as much as possible. You have gorgeous, moisturized, shiny hair now. You like that, don’t you? Unfortunately, I don’t have the best news. After months of personal research and experimentation and hearing reports from many other no ‘pooers, it’s never going to be easy to get the oil out of your hair without using slightly extraordinary measures. Olive oil is tough, because there are some olive oils that are acceptable, but it’s hard to know which ones they are. I’ll cover why this is in a later post soon. But for now, I think avoiding olive oil all together is smart. And coconut oil is just a pill to get out of your hair, if you’re washing with castille. If you’re no ‘poo, stick to the lighter oils like jojoba and apricot kernel. That will make washing MUCH easier. You’re going to want to wash with some sort of soap, be it castille or a very, very mild (SLS-free) shampoo. I am REALLY liking Aubrey Organics these days; their ingredient list is phenomenal, and the tea tree oil shampoo is perfect for this. I know, I know. You want to stay away from anything labeled shampoo all together. But if you really want the benefits of a hot oil treatment, but you only use it twice a month (for example), it hardly even counts as a shampoo. And if you stay away from shampoos that contain detergents, you won’t risk stripping all the good oils you’ve built up on your scalp. Before you wash your hair with whatever medium you choose, apply a liberal amount of baking soda to your hair and scrub. Then wash. If you’re using castille, you absolutely need to finish with a liberal rinse of apple cider vinegar (and water) or lemon juice (and water). This clarifies and rebalances the pH of your hair. Consideration: Instead of washing with castille or shampoo, try washing with your baking soda mix and then “washing” again with conditioner. I’ve tried this twice, with mixed results (one time it worked phenomenally, the other time wasn’t quite as much of a success). The conditioner contains oils which, if you remember the oil cleansing method, dissolves the oils on your hair. Like dissolves like. Lastly, if your hair is still oily after it dries, try using a dry shampoo to soak up the rest of the oil. Are You Ready For Your Hot Oil Hair Treatment? If you don’t know where to buy any of the ingredients you’re excited to try, check your local natural foods store or Mountain Rose Herbs (the latter will most definitely have everything you’re looking for). So are you ready to try? Even if you’re no ‘poo? If you have a tip that I didn’t give – something that’s worked wonders for your hair – PLEASE for the love of Pete, share it here! These are great tips for washing it out; lots I haven’t tried. Of course, the two cheapest oils… oh well. Does anyone know why coconut oil in particular is such a pain to get out? I think it might be because it’s such a heavy oil? Maybe try taking the cheapo oils and mixing them with a lighter one. It may work? Maybe. I don’t know, coconut oil has always seemed really light to me (when it’s warm enough to be liquid). I don’t have much experience with oils in larger amounts other than coconut oil, EVOO and castor oil; and compared to the latter two coconut oil is practically water! I have only used jojoba and sweet almond oil in teeny little drops, so it’s hard to tell how heavy they are. I do wonder if the fact that it’s solid at room temperature factors into the reason coconut oil is difficult to remove. I’ll have to experiment—and I will definitely be mixing oils. But I don’t want to give up on coconut oil quite yet! Okay, so I know that I said before (on your initial hair extravaganza post) that crunchy conditioning treatments don’t work for me and I asked for oil free help. But, after reading this post I am going to give hot oil packs another try. I have used olive oil or coconut oil in the past, and as you said, it works terribly if you are no ‘poo. I’ll give it a go with jojoba, and I just happen to have some Aubrey Organics shampoo that I use for my daughter so I’ll use that to wash out the oil. I’ll report back with the results! Cross your crunchy fingers! Hmm… I don’t use shampoo, and my hot oil treatments are almost exclusively olive oil and coconut oil. Then, I wash it out like I wash my face: honey! I find that unpasteurized honey makes for the VERY BEST cleansing method. Sometimes I mix it with equal parts vegetable glycerine. I don’t need much (a tsp. of each for shoulder length hair), and just use the mixture on my scalp. I massage it in JUST like you mentioned above, Betty, and then rinse. I will have to try this. Just checking—you use the honey in the shower after rinsing a bit? I once misread directions for a honey…thing (I’m not sure it had a name, actually) and ended up applying it like conditioner, and it dissolved pretty much as soon as I put it on my wet hair. Does the oil change this? Or did you do it before the water? Or does it work even though it’s not sticky anymore? I am super excited about this, because usually I feel like I’m being counterproductive, scouring my head with baking soda and soap after the nice nourishing oil. Plus, honey! Ooooo, really? I use honey on my face (thank you, Crunchy Betty), but I had not tried it on my hair yet. I am so gonna give that a shot now. I actually started adding honey to my BS wash a few months ago when the “washing your face with honey” challenge came out. I figured it would be good for my hair since its good for my skin). I’ve gotten to the point where I use 1 tsp-ish of BS, 1-2 tsp of honey, 2 drops of neem oil, and a few drops of whatever essential oils I’m in the mood for. I put it all in a jar with 8 oz hot water and swish until everything is dissolved. I pour it on my head in sections and scrub a bit, then clip my hair up on my scalp while I shave my under arms and legs. Rinse it out, followed by an ACV rinse, and voila! Add 1tsp of coconut or avocado oil to my hair (not at the scalp) as a leave-in conditioner and go about life feeling good about my choices! I only need to do this 2 times a week. I’m going to try this too! I’d much rather oil and honey than to follow up with baking soda and soap. I wish I could use honey! I find it too drying, which I did not foresee. I’m sure I could use it occasionally, but not consistently. Interesting. I have superfine blonde hair, which tends towards oily (although not nearly as bad as it was before no ‘poo). When I’ve done a serious oil treatment I’ve found that BS alone doesn’t get it out, and soap alone won’t get it out, but if I rinse with BS first, following it up with soap does the trick. It’s like they need to work together. I’ve found, as a no ‘poo person, that I can get coconut oil out of my hair reliably by “shampooing” twice with a paste made from castille soap and baking soda. I have thick, wavy hair that gets oily pretty quickly. You’ll need to follow up with a pretty good conditioner- I make an herb-infused flaxseed gel that my hair LOVES. Certainly! I found a link to this recipe in the comments on the flaxseed hair gel post, and I’ve been using it for months with fatastic results. I keep it in and old shampoo bottle in the fridge, and it lasts me about three weeks. I made the flaxseed gel shampoo last night! I tried it out this morning, which was probably a bad idea because I had put coconut oil in yesterday, so I required more than just your average wash. I tried the flaxseed first, and my hair still felt oily afterwards. So I gave a good going over with my BS mixture (1tbs:3cup) and it felt improved. I gave it another round of flaxseed gel and it seemed to have lost its oiliness (but after I’ve been at it for a while I start to lose sense of what’s oily and what’s normal!). I then did a lemon juice/chamomile/water rinse (left it in for a minute) and that was it. My hair dried quickly and is clean, shiny and soft!! Doesn’t feel dry or heavy at all. There is a slightly less clean part at the back, but I’m putting that down to “missing a bit”. Overall, very happy, and I can’t wait to try it on a ‘normal’ wash (ie. not following an oil treatment). Yay!! Thanks for the inspiration Maggie. I’m glad you like it! ^_^ I’ve been using it as a conditioner, but I have some baking soda build up so I’m going to try using it as my sole hair cleansing method next time. Do you add any water to dilute the castille soap, or just use enough to make the paste with the baking soda? Looking forward to trying this. Ah, I’ve been running into problems with hot oil and no-poo, and I was seriously expecting you to swoop in and solve all my problems. Dangit. Before I shower, every single time, I take a small amount of jojoba oil and massage my scalp, and that generally washes out well with my baking soda and water “no-poo” solution. But lately I have noticed my hair is breaking a lot, and since I don’t particularly care for these new bangs I seem to be ending up with, I have tried using hot sesame oil, and it most certainly DOES NOT wash out well with the baking soda & water solution. I guess for now, I will stick with jojoba oil since it does tend to wash out fairly easily, but I am highly tempted to buy an organic shampoo just so I can do the full hot oil that you recommend. All those herbs sounds looooooovely. Do you mean that you wash your hair (with BS) every day? I always had oily hair and was washing it every day with regular shamp/cond. When I went no ‘poo, I was trying to extend it out to every second day. After a while I found my hair was breaking a lot, so I thought the BS might be drying it out. I now only do it once a week maximum, and put a little coconut oil in when I can to stop it from drying out. I cycle and wear a helmet a lot, so I have a sweatier head than most. I give my hair a rinse and a scrub with just water maybe every 2nd or 3rd day to get the saltiness/sweatiness out of it. It won’t be “wear-out-able” after a plain rinse, but it’s noticeable softer and cleaner, so it’s good for another day or two of wearing it up. If you’re washing it every day, I’d say try and do it less. It might be less harsh than shampoo to use BS, but you’re still stripping the oils away to some degree, and the more you do that, the more your head makes more. Alrighty there, Crunchy Betty aka tress-goddess! I heated my oil blend, massaged it into my scalp, fought with the spastic wrap, and topped it with the hot towel, and waited an hour and a half. Then I shampoo’d twice with a sulfate-free sample I had (afraid that my coco-castile wouldn’t get the oil out). I went ahead and conditioned, then I scrunched, gelled, and waited for it to dry. It’s winter and took forever, but… I LOVE the results! Soft, shiny, bouncy, and super-moisturized. Once I get a proper shower-cap, I’ll be doing this at least once a month. But then, I may just get addicted to it and do it every week. My husband is on a business trip right now and I asked him to bring me home one from the hotel. Positively indulgent! I’m whipping up a batch right now! Thanks for the inspiration! Hi Crunchybetty, I have a question. In your perivous post, you said to use low heat setting when infusing the oil with herbs then add essential oil at last. I understand we don’t want to heat up the oil and the essential oil. But here, we are “heating up” the oil…is this process gona make us lose the beneift of the oils? I am so confused…. Warming up an essential oil (EO) won’t damage its properties (EOs work by energetic vibrations which resonate with your body’s energy to bring about balance which brings about healing). *Cooking* an EO, such as when you’re creating your infusion, *will* destroy the properties: that is, the thermal vibrations will amplify the EO’s vibrations until they disintegrate, MUCH like soldiers marching in step over a suspension bridge will amplify the waves of the bridge to the point of collapsing it. Hence why soldiers break step while they’re going over the bridge. Small random footsteps (gently heating the oil preparation) won’t collapse your bridge. When you cook your infusion, you’re subjecting the ingredients to much higher temperatures than you do when you gently warm the solution. Also, cooking the infusion over the stove is done for a much longer period of time than warming it up in the bowl of water for a couple of minutes. See? So, in essence, you’re still getting the benefits of the EO while allowing heat to help your hair and scalp accept the *other* oils and yummy/crunchy ingredients. Happy crunching! And my sincerest thanks to Crunchy Betty for this blog and HOT instructions! I’m happy with the beginnings of mine!! –Your friendly neighborhood certified massage therapist and natural healer. I am wondering if anyone has tried the Rhassoul clay to get the oil out of their hair. I have done oil treatments and hate having to use shampoo to get the oil out. One thing that I have done is to do my oil treatment when I know I will have several days at home. Then when I wash my hair with my ‘no_poo’ borax water it doesn’t matter if it gets super clean because the next time I wash it in a day or two I will get more of the oil out and my hair benefits from the oil being on it longer. I am waiting for some Rhassoul clay so I can do and oil treatment and try the clay instead of shampoo. I will post when I have results to share. can grape seed oil be used in the hair? I wish I would have read this post before tonight..
Don’t consider it a failure! You just went 9 days without shampoo, that’s an awesome effort. I reckon more people should try the no ‘poo thing by just reeling back the shampoo usage first, and then slowly changing over. I went cold turkey and it was really hard at the time. All good now though. Keep at it, girl! Thank you for the encouragement! I’m gonna be stubborn and stick with it. I’ve had great results using the oil cleansing method on my face and so I’m determined to find a natural routine that will work for my hair. I find the oiul is easier to rinse with just conditioner. Just mix a bit of condistioner 1:1 with water and use that for removing the oil, then 1 shampoo wash is plenty. First I made a BS paste and massaged it into my scalp AND used Aubrey Organics shampoo on the rest of my hair. I also used Aubrey Organics conditioner and then an ACV rinse with cold water. I was hopeful but, nope, my hair was still covered in oil. Today I did it all over again, really working everything in. Still feels oily (although it isn’t dry yet so I don’t know just how oily it is). I really really hope I don’t have to use real shampoo to get this out. Anyone have any other suggestions for rinsing? I haven’t tried castile soap yet… I’m hoping for some miracle before I get heavy handed. But I’m guessing I already ruined my no ‘poo perfection with all the washing I’ve done in the last two days. I once misguided-ly put coconut oil on my hair (I’m no-poo), and I found that shikakai does a good job of getting it out, as long as you really get it all over the oily parts. have you tried ” Everyday Shea ” shampoo or ” Alaffia ” skincare? Hello 🙂 My name is Allie. I’m a long time follower and first time poster. I’m writing this as I have a hot towel wrapped in my hair waiting for the oils to do their magic. I did mine with castor/coconut/hemp. I was wondering if you have ever experimented with hemp seed oil? I personally LOVE it! I use it for OCM and it’s wonderful and has a rating of 0 on the comedogenic scale. The smell can be a little pungent for some as it is VERY grassy but you get used to it… Thanks for posting this, it’s so incredibly easy! I didn’t infuse mine, just used the oils on their own because I was lazy but will try adding EO’s next time. Take care! Thank you so much for this! I have been putting coconut oil on my hair, braiding it and sleeping in it, but heating it never occurred to me! My suggestion for how to occupy one’s time whilst sitting around with a towel on your head: give yourself a manicure, pedicure, facial… make it total home spa time. Which should also probably include a glass of wine and gourmet cheese to snack on. Also excited to try washing my face with honey and many of your other great tutorials. Awesome web site!! I just discovered you today – coincidence? I think not! Where have you BEEN all my life!? Just yesterday I was chatting about my homemade, natural soap and its ingredients, like coconut oil. My friend told me how her mom back in India used to apply warmed coconut oil to her hair and scalp, leave it in for 30 minutes, and then shampoo. My hair has been dry (baby, it’s cold outside, and DRY inside! ), so I tried it, washing my hair with my own bar soap, and it turned out wonderful, with no problem washing out. I’m very interested in the no ‘poo idea, but how about natural, real bar soaps? Your thoughts? I am trying one right now! SO excited. What I did as well tho was I rubbed the strained herbs in with the oil that was on my hands and used it as a sugar scrub/ exfoliator. Massaged that all over them and up my arms for about 2 minutes and then rinsed and they now feel AMAZING. So I am chopping at the bit to see how my hair turns out. Thanks you sly fox you. Should you wash your hair first and apply the oil to wet hair, wet your hair without washing and then apply, or start with hair that is dry and unwashed? Just tried this, liked it, but have a question: I put 3 different herbs in mine, horsetail, nettle and oatstraw. It seemed tho, I had more herbs than oil. If I aded more oil ( avacado) would it weaken the “serum?” I am seriously thinking of buying one of those old bonnet type “hair dryers” at our local Freds. Talk about some heat! Just discovered that a plastic produce bag can double as a shower cap. It’s much easier than plastic wrap! However, if you’re like me and just stuff these bags into a box as the food gets eaten up, you’ll probably want to turn it inside out before putting it on… unless you LIKE onion peels in your hair. importantly, is glycerin bar soap even good for hair? rosemary EO and try this today. Well I’m attempting this now. I used fresh mint and thyme (I meant to use rosemary but I always get their names confused) and then I added cinnamon, nutmeg and flax seeds. The oils I’m using are safflower, flax, sunflower and castor. After I had cooked this up for half an hour or so, I mixed it with a paste I’d made earlier this week of avocado banana and honey. The main problem I seem to be having is getting stuff hot enough. I poured boiling water onto the towel, but I got impatient and mixed in lukewarm tap water, did this three times (I do learn…but apparently not the first, second or third time) and the towel is too cold. Is the heat necessary for the process, or only a luxury? Follow up the next morning. I forgot to mention that I also added neem oil, which I had around for aphid genocide. Had no idea it was good for hair until I came to this site. Of all the things this site has convinced me to put on my face, natural insecticide would have to be the weirdest. Anyhow, next day, and my hair is still a bit wet (it’s very long and thick) but already I can tell it is much softer than it normally would be after using baking soda. I should add that I did my AC vinegar rinse, which also has a bit of conditioner and honey in it, and followed it up with another rinse of just conditioner and honey, and my hair doesn’t have any oily residue so far. I know this is an old post but I just have to ask, I have tried the above method a few times. My hair is usually very soft and fine with little frizz, however, each time after using this method it gets really frizzy with very fine hair flying every where! Is it possible that since I have a slight skin allergy from the coconut and the almond oil when used very often my hair sort of has a hair allergy to them too?! I know it sounds ridiculous but is it possible? If you only have huge towels, here’s a tip: Use your hair dryer instead. Sit yourself down in front of your TV and on every commercial break, turn the hair dryer on low and hold it at arms’ length. Rotate it around your head until everything is warm. I may have a solution for a few greasy-headed and soapless souls out there. I haven’t used shampoo in a very long time, but baking soda strips color and turns my wildly curly hair…bad, just very bad. Before washing, I use corn starch on dry hair to absorb oil and rinse away easily. To do a hot oil treatment, I put hot olive oil only on the ends (where it’s the most damaged), and rinse with water. After drying, I expect oily. I rub in some corn starch all over the nasty parts, and rinse again, washing with my usual mix of green tea, yogurt, honey, lemon juice, and wine (which I even put on my hair sometimes!) It worked excellently, but this method may still leave too much oil for short or fine hair. It’s worth a try! I found it’sa lot easier to apply with those special brushes for dying hair, I can do my roots properly (hmmm scalp massage !) and then evenly put the oil throughout my mane. It’s also a lot less messier than if I used my fingers. Do you put the oil in dry or wet hair??? So, let me break it down to you: I’m a huge fan of you! And, well, I’m a guy. It felt awkward at first having you addressing most of your readers as women but when I saw that post about Adam it made my day! Anyways, I usually don’t comment on any blog unless I have something useful to say, which in this case I DO! That’s when I started using (and loving) oils. I was using a mixture of castor oil and sesame oil infused with ginger as a hot oil treatment and it really, really helped! But there was a downside to this: shampooing! Shampooing brought back all the bad memories along with the dryness and frizziness. But one day, I thought it was such a shame to waste oils like that! I wanted to use them for my hair and I thought there MUST be a natural way to do this! So I researched and researched and well, I think I found the solutions ! Yes, you’ve heard me, there IS a way for washing the HOT out of your hair without using even a bit of shampoo! It’s all natural. Eggs. Eggs’ yolk to be exact. It works wonders on sucking those unwanted oils without taking any of their benefits away. Plus, it’s rich in protein ! Mix them very well, and you’re good to go! Apply the mixture to you hair, now 1 egg yolk is more than enough for me, but I am a guy and I do have a short hair, if it’s not enough fornyou ladies just double it! And now leave this as a mask for at least 20 minutes and no more than an hour. And the timing is very, very important! This is the key, actually! You have to let it sit for 20 minutes or more or else you’d be just wasting an egg! So make sure you plan ahead for this if you’re doing the HOT before an event. And don’t leave it for more than an hour ’cause yolks tend to get rotten pretty quick. After your 20 minutes have passed, go into the sure and wash with cold (COLD) water! Again, heat will cook the egg so avoid that! 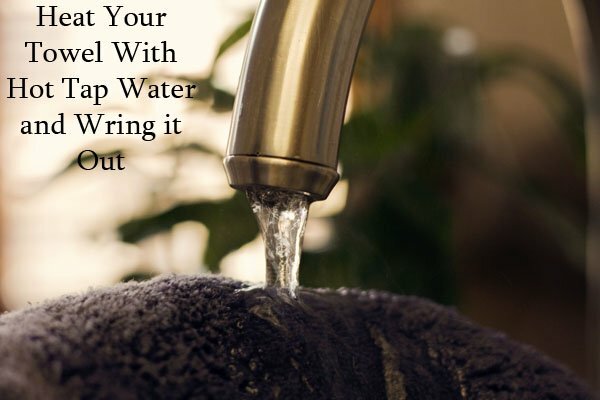 Your water doesn’t have to be extremely cold just cold enough to not cook! Aaaand ta daaa! That’s it! Don’t believe me? Try it yourself! You’ll have no oil on your head! Just soft and moisturized hair that feels very great when you touch! I hope this well help! I know it’s a year late and I’m kind of afraid it won’t be read but I hope it will! The egg yolks worked for me! I did a hot oil treatment, and couldn’t get all the oil out. I’m no ‘poo, so I really didn’t want to use anything harsh. I put two egg yolks in a jar, added a bit of water, and shook it until it was mixed. I massaged it into my hair, rinsed, and am left with soft shiny hair, and no oil at all! in making foods such as hollandaise and mayonnaise. amino acids that repel water and some amino acids that attract water. Thank you. I will certainly try that for my hair. A co-wash (conditioner only) usually works for me. I detangle and then rinse ( sometimes 2x), then I put on a better/deeper conditioner. out better and is not as harsh on your strands. I use bs for poo, sometimes I add a bit of Dr. Bronners to add some suds factor to it. One time “I wasin a hurry and grabbed the castor oil instead of the soap. I couldn’t figure out why my hair suddenly smelled bad& was oily until I realize what I had done a couple washings later. I used shampoo to get the oil out (prefer not to do that). But anyway I have had some crustiness/dandruff problems since jr high. After this mishap I noticed I didn’t have a problem for several months. I have been thinking about doing it again but this time I will be aware that I’m using it & will use one of the other techniques to get the oil out. I have tried this twice now since I found this article about two weeks ago! Phenomenal!!! Lovely! Thank you so much!!! I’m really interested in trying the coconut oil treatment in hopes that it can help my itchy dry scalp without having to use dandruff shampoo. My only concern is that this treatment seems aimed at people with straight hair. I have extremely curly hair (Botticelli if anyone else has read ‘Curly Girl’) and I haven’t used shampoo in years, because my hair needs more oils than straight hair and shampoo strips the oil right out. I usually only use conditioner. While I have no problems with using a shampoo to get the oil out if need be, I’m wondering if I will really need to get rid of all of the oil, especially on my scalp. I feel like scrubbing it all away might be too harsh for my scalp and will undue any good the treatment will do. Leaving some of the oils in might be better for my scalp, but I’ve never done an oil treatment before, so I don’t know. Does anyone else with curly hair have any tips? Im a Curly Girl too and havent used anything but Devachan’s One Condition to ‘wash’ my hair for years. I’ve had problems getting HOT out of my insanely thick curly hair, so I am going to use Avocado oil for a HOT with a bit of tea tree to try to calm the itchiness of my dry scalp. Then I am going to try the egg yolk ad honey to ‘wash’ it out. Excited! I’m using the leftover coffee grounds/rosemary/thyme/sage/chamomile in the last bits of oil as a body scrub while my hair sets, and oh my. Recommended! Morrocan Oil is ok, but I just love Shielo’s new Shine Restore Oil! After shampooing and conditioning, I part dry my hair, add one pump of the Shielo Shine Restore Oil then comb with a wide tooth comb, and either blowdry or airdry depending on my mood. My hairdresser recommended part drying your hair first as it seems to help the oil sink in rather than just slide off with the water on your hair. The Shielo Oil leaves me hair incredibly soft and silky with no flyways (though I didn’t have many to start with) and cuts down drying time. I love how shiny it makes my hair. I had to go without for a month on my honeymoon recently, and boy did I miss it! My hair felt awful by comparison, and I found myself washing it more frequently just to try to make it feel soft. Was so glad to have it back when I got home! Yes, it’s expensive, but considering how little you use and how amazing it will make your hair feel, it’s totally worth it. Do you apply the oil to wet or dry hair? My short, curly, not very soft hair just finished an amazing hot oil treatment. Feels so good I’d like to make this a weekly regimen. I used half coconut oil and half avocado oil and infused some dried sage from my garden. My hair is short and I do ‘poo. it took 2 washes to get it out, but it wasn’t hard. I can imagine it might be hard to get it out of long hair though. OILY!! my hair is oily already but works lovely with the oil treatment… Just wondering if there are any other tips for getting the oil out!? just be patient and go slow. if it doesn’t all come out at first, just put your hair into a sleek chignon and try again later. I have been doing these for a few months and have gotten used to it. ‘Luck! My exceptional instructed us to search for web pages that debate armer26p after i unintentionally uncovered your site and endure ALIEN SPACESHIPS TO Assault EARTH IN NOVEMBER 2012!. I am seriously impressed with your remarkable article! There are certainly a lot of particulars like that to take into consideration. That is a nice level to carry up. I offer the ideas above as normal inspiration however clearly there are questions just like the one you carry up the place a very powerful factor will probably be working in honest good faith. I don?t know if best practices have emerged round issues like that, however I’m sure that your job is clearly recognized as a good game. Each girls and boys really feel the affect of only a second�s pleasure, for the remainder of their lives. I found your weblog website on google and test just a few of your early posts. Proceed to maintain up the excellent operate. I simply further up your RSS feed to my MSN Information Reader. Searching for ahead to studying extra from you afterward! I found your weblog site on google and test just a few of your early posts. Proceed to maintain up the very good operate. I simply additional up your RSS feed to my MSN Information Reader. Searching for ahead to studying extra from you later on! The following time I learn a weblog, I hope that it doesnt disappoint me as a lot as this one. I imply, I do know it was my option to learn, however I really thought youd have one thing attention-grabbing to say. All I hear is a bunch of whining about one thing that you may repair in the event you werent too busy in search of attention. I have never done a hot oil treatment before. Is my hair wet or dry when I’m putting the oil on my hair? Thanks! has anyone replied to you? cuz I am in the same situation I am still wondering !! please tell me if you can I really need to know Lanea , thank you . I think it’s best if you do this on dry hair as water is resistant to oil. They don’t really mix so your hair will probably absorb the good vitamins and heat if it’s dry. I’ve done both ways & see no difference. So try both & go with your preference. I have started hot oil treatment for my hair but, firstly, I would like to know is it recommended to apply the oil on dry or damp hair?, secondly I would like to know which is the best and most effective oil to use ? cuz really I used olive oil but I am not sure if it is the best , thirdly I couldnt understand what is “no ‘poo” term , it would be great if someone reply to me , thank you very much. no ‘poo is no shampoo used. I don’t care for the smell of olive oil so I use coconut oil. It boils down to personal preference. Coconut oil starts in a solid form but melts quickly at body temperature or below. I’ve done both dry & damp hair but found no difference between them for me. Try both ways then choose what works best for you. Crunchy Betty encourages us to these things with our own special twist. Who knows, you may just discover something wonderful that would work for others as well ! Good luck & have some fun with this! This sounds totally luxurious, I am looking forward to trying it. I’ve just started no ‘poo so I will be interested to see how this works (I’m still in the waxy roots, dry ends stage of the process). Love your site & writing style! Getting a lot of new ideas to add to my small arsenal of going green, getting away from crappy chemicals and just in general improving my life & health. I have been using extra virgin coconut oil in my hot oil treatments for many months & love the way it makes my somewhat over 50 & slightly graying head of hair feel! I use my own homemade soap in place of ‘poo (and shaving cream as well) & it works quite well in getting the oil out but keeping the wonderful softness & shine in my hair after treatment. The soap is made of coconut oil, olive oil, palm oil & a little beeswax. If any of your readers are soapers I would encourage them to give their homemade bar soap a try in place of ‘poo & shaving cream. My head used to itch something awful before I stopped using commercial ‘poo. I’ve been non-commercial for over two years now & am not going back, ever. The difference was quick & amazing. With the combo of my homemade soap, hot oil treatment and occasional use of baking soda & vinegar on my short tresses I feel great & am itch free! Rock on Crunchy Betty! Can I use vegetable oil? Could I use grapeseed oil? And how much lemon juice should I put in the rinse water after my castille and essential oil “shampoo”? For no pooers out there doing hot oil treatments , simply use a natural hair conditionner, massage into hair and rince. Strangely, I found this works a billion times better than any shampoo to get rid of the oil. 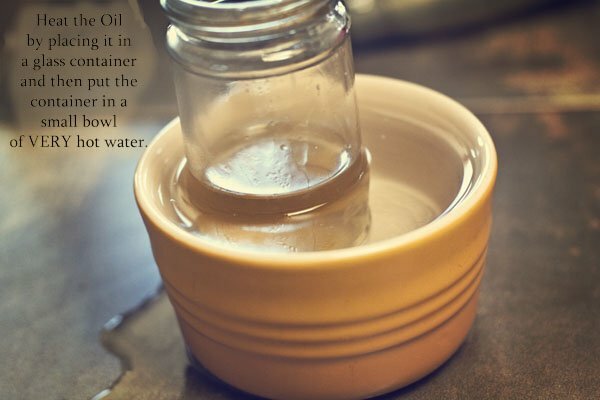 If using really thick oil like castor ( my favorite !) massage in, rince and repeat. 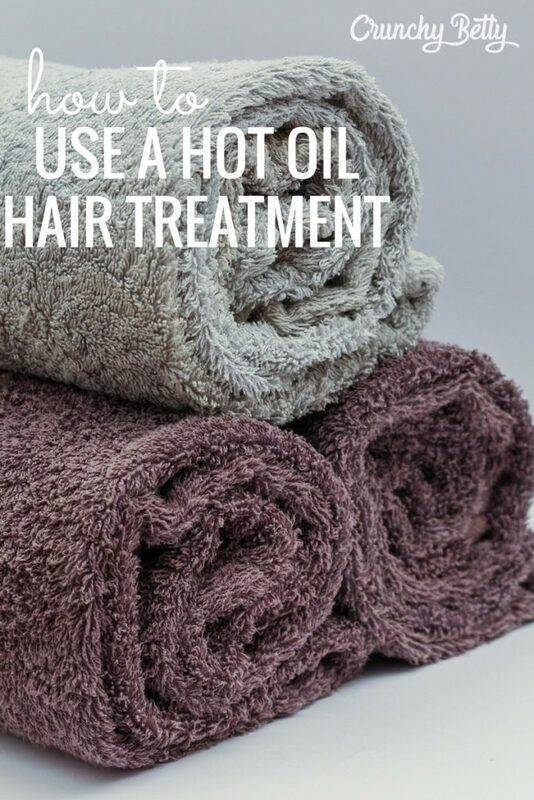 Hi, thank you for the great idea of the hot oil treatment, I read through both parts but didn’t see whether I need to wash my hair before the treatment or not, also if I don’t need to, should I damp my hair anyway? I have horridly dry brittle ends, curly too. Could never find a stylist that was able to answer why or what to do bcuz my hair was very healthy until it got to the bottom. ALCOHOL was the problem in manufactured hair care. Since I figured it out (yeah me!) the change has been amazing. I’ve done the no’poo, didn’t have good measurements, switched to coconut milk poo w/ Dr. Bronners very pleased & after stumbling onto you Miss Betty I went back to no pooing. TY for your incredibly informative no poo post. Made this hair oil & love it. Just as a note, anyone with brittle ends like mine the heaviness of coconut oil is very beneficial. It even works great as a leave in frizz fighter in tiny amounts just on the ends. Great blog: I like the quality of the info! I have been doing homemade hot oil treatment for years, but I always wash my hair before as I was told that hair must be clean in order to absorb oils. I was curious what is your opinion on that? It make sense especially if your hairs are covered with styling products. Overall, I think the key is not to overload hairs with oïl. Can I add oil to the bottom six inches of my hair? My hair goes down to my bum and the ends are super dry. I don’t wash my hair more than three days a week currently. Should I use more than a tablespoon of coconut oil and a tablespoon of castor oil? I don’t have any other herbs, clays, or oils I’ll be using at this time. When you say oil blend can I put regular oil. Or does it have have to be special one? I simply wish to inform you you the fact that I’m really new to putting up a blog and really valued your review. More than likely I am likely to store your site post . You seriously have impressive article stuff. Love it for discussing with us your web webpage. Very intriguing advice that you have said, thank you for setting up. I really hope to notify you that I am inexperienced to wordpress blogging and thoroughly valued your information. Probably I am probably to store your site post . You certainly have lovely article topic. Truly Appreciate it for sharing with us your blog page. Definitely beneficial highlights you’ll have said, say thanks a lot for publishing. I discover there are countless junk on this blog site. Could you be intending to clear it up. Probably I can help to carry out? Has anyone mashed in the berries? I tried 1 strawberry, and the consistency of the treatment is totally different–much thinner and not oily. Wearing the towel now. I’ll report back. Thank you for one’s stunning posting! I really liked browsing your remark, you might be a great source. wish for to say concerning this post, in my view its truly remarkable designed for me. try coconut milk) with similar results (the latter being easier to wash out). Which treatment is better, more nourishing, for hair? HELP PLEASE!! 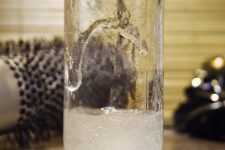 So after following Part 1 and making the oil treatment, I look at Part 2 which says not to use coconut oil if I am doing the No-Poo method… Since my treatment was already finished before reading this, I decided to tough it out. Now, my hair is totally greasy!!!! Does anyone have any suggestions?? I read somewhere for no pooers you can mix a raw egg with a little water, and if want add a little raw honey or lemon juice. Some say add mayonnaise. But basically it’s the raw egg that will take the oil out. I am currently trying out no poo and did a coconut oil hair mask and had the same results as you. Super oily even after two no poo washes. The egg was messy, but got it out pretty well. Third time was a charm i guess. Hope this helps. One more thing to consider is that eggs are packed full of protein. They are beneficial for hair only if used no more than every two three weeks. Any more than that may damage hair. P.S. I love this blog, so much. I think about it only 1029842983575928375 times a day. Have a tip for those no pooers that enjoy oil treatments….eggs. Mixing an egg with some water helps to wash the oil out of your hair. Take one egg and mix with a few Tablespoons of water. Coat your hair with this mixture being sure to get your scalp and leave on for about fifteen minutes. After fifteen minutes, use whatever is left in the bowl and coat your hair one more time, massaging it into your scalp again. Rinse out in the shower with cool water and follow up with your version of shampoo. All this information is just awesome!!! I have made myself the hot oil using olive oil and rosemary essential oil with few herbs in it. I have very dry damaged hair with little frizz in them. I have planned on using apple cider vinegar rinse after removing the oil by shampooing. I wanted to ask if i need to use a conditioner after that vinegar rinse. I have just followed this once but i read on many blogs that vinegar rinse leaves your hair ends dry. But i doubt if they are using oil treatments like me. Sigh. I really need to learn my lesson. ALWAYS check with Crunchy Betty first. I’m no poo, and I didn’t read this before doing an oil treatment. With coconut oil. Lots of it. All I have to say is at least I’m just hiking today. Braid it is! And I hope a 16 hour oil treatment works out for me 😉 I’ll try the baking soda and ACV rinse stuff when I get home. In the meantime, I will enjoy having straight (ish) hair for the first time in my life. I’ve found that coconut oil works incredibly well with my version of no ‘poo, which is using soapnuts as a detergent to clean my hair. I treat my (very very bleached) hair with coconut oil before washing about twice a week and use a little bit more after washing as a leave-in conditioner. Hi…can i leave the treatment on overnight? i am excited to try this my hair is so dry and frazzled. so how often do you do this oil treatment? once a week? every other week? would more often be too much? Hi Betty! Really appreciated the time and care you took to share the hot oil hair treatment process according to your experiences. I’ve done my own “intuitive” style of hot oil treatments–overlapping w/much of your advice–and I enjoy the combo of coconut oil & jojoba oil on hair & skin, but definitely picked up some new tips. Rock on, Lovely Lady!